WASHINGTON -- Russian jets buzzing a U.S. military ship and planes in the Baltics are escalating tension between the two nations, the chief of naval operations said Monday. "My hope is that we can stop this sort of activity," Adm. John M. Richardson told reporters at the Pentagon. "I don't think the Russians are trying to provoke an incident. I think they're trying to send a signal," he said. "I think it's pretty clear that they are wanting to let us know that they see that we are up there in the Baltic." The Baltic countries regained their independence in the early 1990s after nearly five decades under Soviet occupation. The Defense Department said a Russian SU-27 conducted a barrel roll Friday over a U.S. Air Force RC-135 that was flying a reconnaissance mission above the Baltic Sea. In mid-April, a Russian jet flew about 50 feet from the wing tip of a U.S. aircraft. 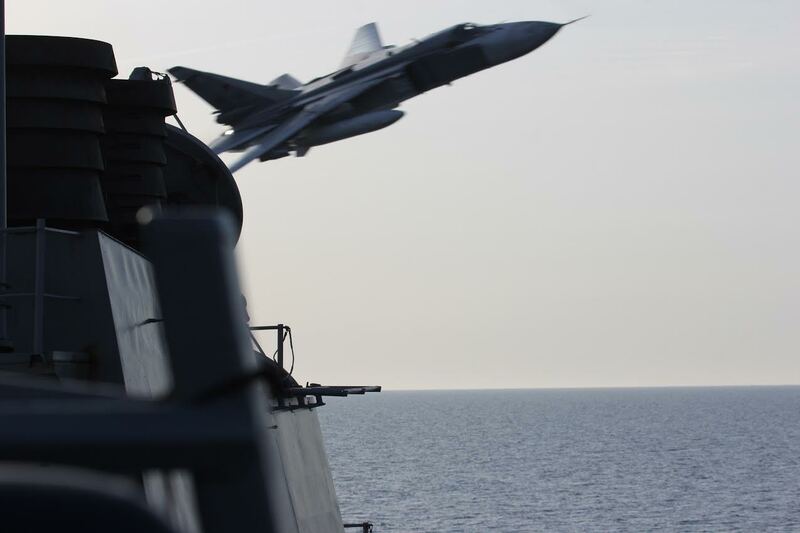 Also in April, two Russian jets flew close to the USS Donald Cook in the Baltic Sea. Richardson said the actions increase the chance of a "tactical miscalculation," but that if an incident were to occur, the U.S. would tamp down any rise in tensions between the two countries. "We look for sort of a normalization there," he said. Russian Foreign Minister Sergey Lavrov last week defended the actions of Russian warplanes that buzzed the USS Donald Cook, saying the pilots decided to take a look at the U.S. Navy destroyer "from a safe distance." The planes were less than 100 feet away from the deck of the ship, traveling at hundreds of miles per hour. Secretary of State John Kerry condemned the Russian actions and said the Navy ship could have opened fire.